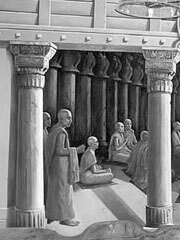 In Buddhism, the Patimokkha is the basic code of monastic discipline, consisting of 227 rules for monks (bhikkhus) and 311 for nuns (bhikkhunis). It is contained in the Suttavibhanga, a division of the Vinaya Pitaka. It is not so much a rulebook for monastic training as it is a distillation of what’s really important in Buddhism. The essence of what Buddha said went something like this: Cease to do evil, cultivate that which is good, purify the heart. This is the Way of the Awakened Ones.